As the weather gets cooler, I always get caught up thinking of what meals I should create in my crockpot. I focus on squash, dumplings, gravies, potatoes…the starchy things our tummy tend to love. Someone needs to figure out how to create a dish like mashed asiago, garlic potatoes with rosemary, butter creamed gravy that will feed & nourish your body like a no-salt added broccoli, cauliflower, black bean, kale, protein packed mash…. I try to be good about including fresh items into each meal & after my guy asked if we could start doing vegan or vegetarian lunches about 2 months ago, (he comes home for lunch everyday, I try and schedule to be here, it’s nice ‘us’ time in todays busy life). I was a little surprised, but thought it was a great idea! Flash back to before his request….I would bbq marinated chicken with a quinoa & grill veggies or a loaded shrimp stirfry & rice, maybe a meat loaf with gravy & mashed potatoes…we are talking FULL MEALS…like I do for dinner. We were left very satisfied, but really, unnecessarily. Remembering that is like instantly entering a food coma. Since focusing on plant based meals more often, we have more energy, don’t get the afternoon slug feeling, & have a more satisfied feeling for longer. We also know that our bodies (and the earth) appreciate in many more ways than we know. The Netflix documentaries I tell you, they will get your brain & heart reeling. One of the ways I have found this to be very easy is to prep!! I enjoy being in the kitchen & organizing, so when I find I have a half hour or so, I get out my tupperware and get started. I will open and rinse 2 or 3 different kinds of beans (chickpeas, black beans, white kidney beans are favourites! ), pop them into separate containers and stack them in the fridge. I then wash, dry & dice veggies, (kale, red, white & green onion, sweet peppers, celery, carrots, beets-Costco has the best vacuum packed clam shells of them, zucchini…the list goes on. These all go into their own container and into the fridge. I will place a small piece of paper towel in ones that may wilt or need to stay dried like kale. some veggies you want to keep whole unless you will be using them that day, (tomatoes, mushrooms, etc). I may dice up some smoked tofu or other vegan protein to have ready and on hand. Doing this prep makes it do easy to grab & throw in handfuls of whatever meets your fancy when deciding to whip up salads, soups, scrambles..whatever you have a craving for. It also makes it so much more fun & you will probably end up eating more of a variety than usual!! 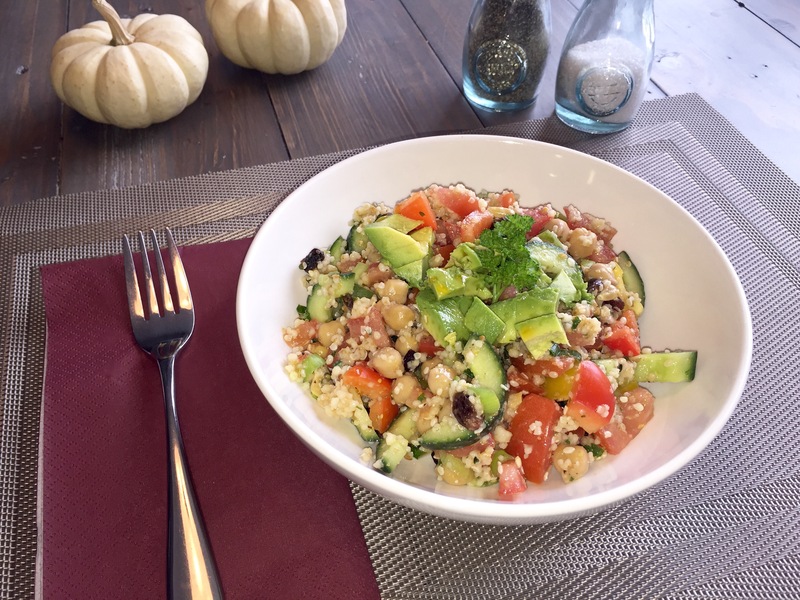 Today with the cooler weather I decided I wanted to have a cozier feeling carb so I went for a quick and easy couscous! 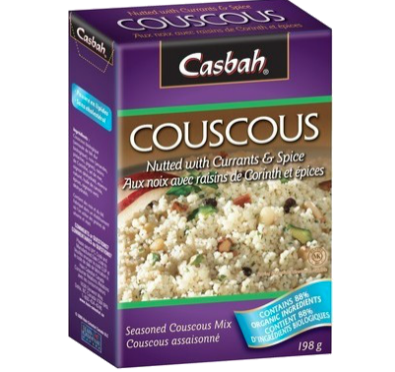 My favourite brand is Casbah’s Organic Couscous. You can find it at most grocers, I often go to Superstore. There are a handful of different flavours & can be used on it’s own or mixed into other ingredients. The result I had from grabbing containers of ready to go veggies and a few other cabinet finds was a Salad that made me feel heart healthy!! Couscous: Start cooking the couscous according to the directions. I chose to add 1/3 cup raisins to add a little more sweetness for a treat! Rather than a plain oil, I used half spicy stir-fry oil & sesame oil. 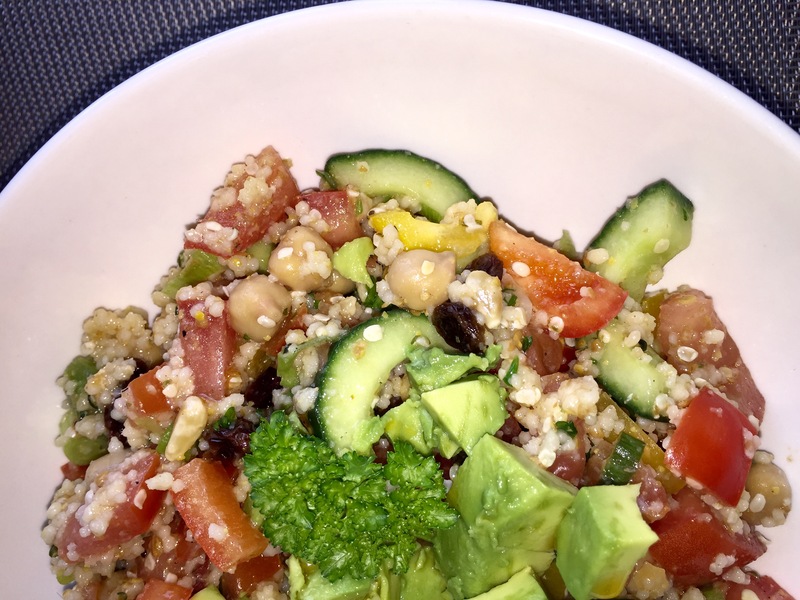 Prepare the rest of the salad while the couscous is doing its thing. I chose to top with avocado for some additional heart healthy fat, a little spicy oil & parsley from my herb garden. It is cozy while leaving you feeling fresh & satisfied! Of course alter as you wise!! You could throw some tofu, meat, seafood or feta cheese (vegan cheeses are available at most stores), however with the ingredients included here, you are receiving quite a bit already! This made me very hungry; great post, Kiera! I love centering my fall menu around root vegetables, sometimes, making them the “star” of the meal /main dish. Thanks for sharing Kiera!